I have been hanging out in the Paleolithic trying to find the earliest example of organized information. So far, that seems to be incised artifacts from around the time of prehistoric cave paintings, a highly creative era for Homo sapiens. 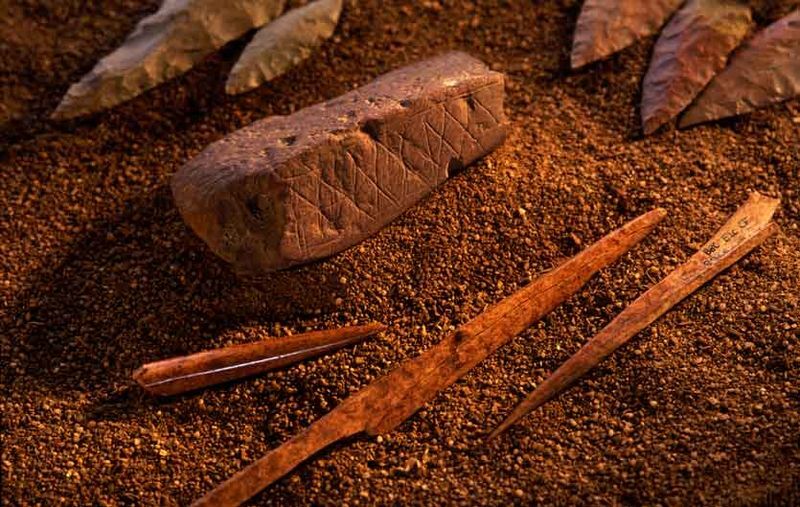 These possible recording devices, from as early as 30,000 BC, tend to be sections of bone or antler with slashes or other types of repetitive marks that look like an early form of a list. In fact, when they were first discovered in mid-19th Century France by Édouard Lartet, they were called marques de chasse, or hunting lists, like notches on a gunslinger’s weapon. These engraved lists are not the earliest use of incised marks. That honor belongs to an ochre from 78,000 BC found at Blombos Cave in South Africa. Here the slashes seem like decoration, a design engraved because it looks nice. It’s worth noting that the design has a repetitive symmetrical quality that may have influenced list makers 48,000 years later. That first list was a long time coming. In the second half of the 20th Century, Alexander Marshack, a NASA journalist turned archaeologist, innovated the use of microscopic analysis on prehistoric artifacts. His most famous example, the Blanchard Bone (actually an antler) from about 28,000 BC, has circular marks reminiscent of the moon. Using the microscope, Marshack (1991a) compared the Blanchard Bone and other possible lists to a lunar model he developed for the purpose. He discovered that groups of marks on many artifacts tend to change with the moon’s cycle, particularly around the time of the dark of the moon. So he designated these artifacts as lunar calendars. The idea is controversial, although otherwise well researched documents accept without criticism the hunting list explanation, which is little more than a wild guess (see for example Hoffecker, 2011, p. 133). One critic (Littauer, 1974, p. 327) included her own suggestions on how the incisions should have been arranged, “(W)hy could not these have been easily made clearer by the insertion of a gap or a vertical indicating the beginning of a new set?” Apparently this researcher didn’t realize she is the product of 32,000 years of information organization. The prehistoric engravers invented the recording of meaningful permanent marks. They also invented the list. The idea of a gap between sets hadn’t yet occurred to them. That didn’t catch on for Latin word spacing until the 7thCentury AD. As a specialist in information organization, I find Marshack’s (1991b) discussion of the Taï Plaque, a French bone from 10,000 BC, to be the most compelling. Although relatively recent among prehistoric engravings, this bone was incised 2,000 years before the formation of Lake Michigan. The notches on the Taï Plaque run in parallel lines with enough daily marks to complete 3.5 years, compared with 2.25 months for the Blanchard Bone. The engraved Taï Plaque fits into Marshack’s lunar model quite nicely; he even includes the solstice in this one. It’s such a good fit that I believe the Taï Plaque has something to do with the moon. However, I’m not sure if it’s a calendar or a device for recording daily events that tend to coincide with the moon. It may be that the dark of the moon is simply a time to catch up on record keeping. The marks on these artifacts are incised in groups, which seems to imply chronological entry or the ongoing recording of something that has already happened, perhaps even the non-lunar products of consecutive mammoth expeditions. It could be that some artifacts are lunar calendars, some are marques de chasse, and some are anything else that needed to be recorded. Lunar or not, the Taï Plaque is clearly a list. Two of the parallel lines are incised to the very edge of the bone and then take a 90° turn so the list continues along the edge. Did you ever do that? On a postcard perhaps? Not quite enough room so you write along the edge. Marshack believed this marking along the edge was done so the solstice could be included within a line of marks. In order for the lunar/solar explanation to work, the parallel lines would have been incised with the baustrophedon technique. That means you read right to left on one line and left to right on the next, continuing back and forth. It’s a method seen as late as the early alphabet. Once spelling gets involved, the various languages tend to settle each into their own direction. But it works quite well if all you’ve got is notches. With the Taï Plaque, and others like it, we clearly see that the first instances of recorded information were lists. If Alexander Marshack was correct and these lists represent lunar notation, then the first instances of recorded information were organized structures, lists in chronological order. Based on the concept of grouped incisions, even if Édouard Lartet was correct and the engravings recorded hunting statistics, they’re still lists in chronological order. Hoffecker, John F. (2011). Landscape of the Mind: Human Evolution and the Archaeology of Thought. New York: Columbia University Press. Littauer, Mary Aiken; F. D. McCarthy & Alexander Marshack (1974). On Upper Paleolithic Engraving, Current Anthropology, 15(3), 327-332. Marshack, Alexander (1991a). The Roots of Civilization: The Cognitive Beginnings of Man’s First Art, Symbol and Notation. (Revised and expanded). Mount Kisco, NY: Moyer Bell Ltd.
Marshack, Alexander (1991b). The Taï Plaque and Calendrical Notation in the Upper Palaeolithic, Cambridge Archaeological Journal, 1(1), 25-61.